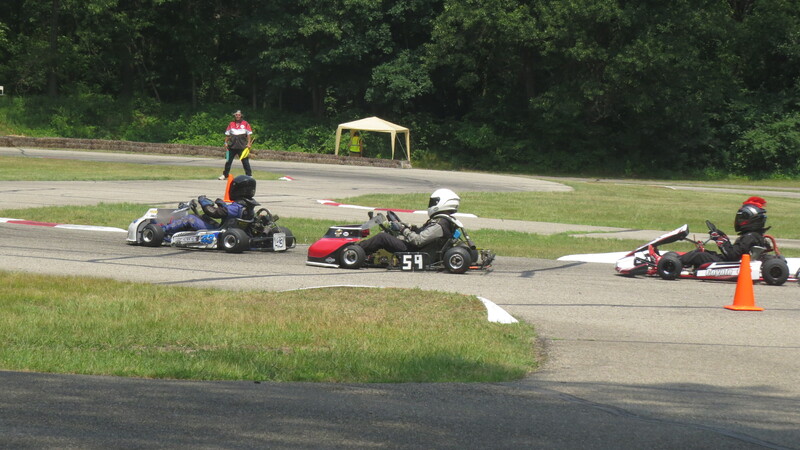 The Champions Cup of North America brought national level racing back to East Lansing Kart Track June 29-July 1. ELKT is family run since the 60s and last hosted a traveling series a little over a decade ago. The track is full of hair pins of various dimensions and just under a half mile. In the historic karts with hard skinny tires this would have been an extremely challenging track. In today’s modern karts with grippy tires and flexible chassis the challenge will be to maintain your speed through each turn to maximize your exits and be prepared to capitalize on others mistakes. We arrived late Thursday night and promptly stayed up because the of the time change and practice started at 11 am Friday morning. It was extremely hot all weekend and our trailers generator was not working preventing us from using the AC unit. Stay hydrated was a great challenge all weekend. We struggled all day Friday during practice to get speed from the kart. It was consistently off the pace by 2 seconds. This frustration continued into Saturday morning the speed was still not there. There were a number of factors contributing to this. The body on the kart was preventing the chassis from flexing and not allowing the kart to twist through the many hair pin turns. We removed the side panels and picked up a half second. The motor was missing at the end of the long runs. We usually attribute this to carburetor issues but could not find anything and even swapped it out. Eventually, we ended up renting a Tony Power motor for the weekend and picked up another half to three quarters of second. While all these mechanical issues were taking place Jason was also learning a new track it took him a bit but eventually he found the smoothness required to turn some very fast laps which would potentially put us in the mix for second place in Saturdays racing. We found some of the speed Saturday for qualifying but so did everyone else. Jason qualified 3rd and finished 3rd in the first heat, he had a slow start and had to pass a slower kart with a very defensive driver and was not able to make ground on second. The second heat he finished 4th due to making a bump draft error and having to give up a spot. The 12 lap feature started badly with Jason dropping back at the start and having to make up spots. He manged to pass for 3rd quickly and after a brief battle for the position he pulled away finished third for the day. 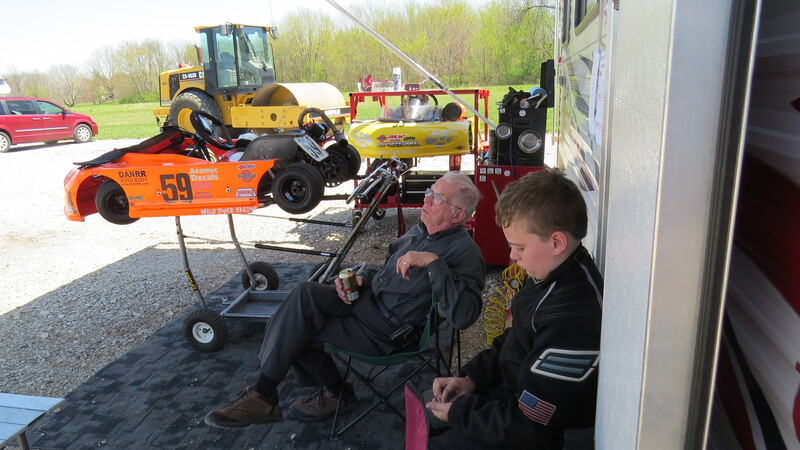 Sunday, we were better prepared, over night we swapped the steering column and put on new tires. These changes quickly showed their merit as Jason picked up a couple of tenths and was definitely in the mix with a possibly of running closer to the front. The only thing that was holding him back was the starts. After the first heat, we rebuilt the clutch with new springs hoping they would do the trick but the next heat showed we had the wrong springs. There was not enough time to change them out for the feature so we just had to live with the results and hope for the best. The feature started and Jason moved to the back but put continuous pressure on the 43 who was doing the same to the 25. 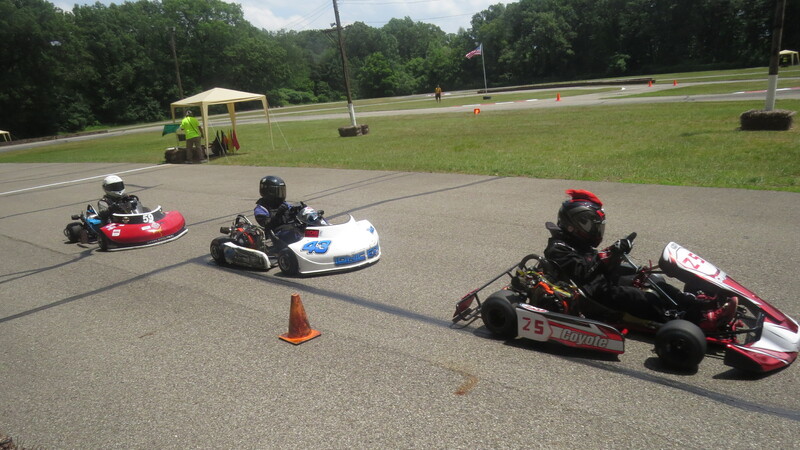 The three karts ran nose to tail for the entirety of the 12 lap race. As the trio entered the final hair pin of the last lap 43 made a desperate move for a pass on the inside and pushed 25 wide allowing Jason and the 43 to get by. The move, however, was reviewed after the race and 43 was put to the back giving Jason 2nd and 25 3rd. Next up will be one favorite weekends at Grattan Raceway. Jason will spent it either racing or fishing at the infield pond. He has plans to fish for bass and is looking forward to racing with the Animals Sr class again. We will also post some video of Jason in the Glenview 4th of July parade. Thanks Jim Liperi of Coyote Motorsports, Chris Cirillio of Tony Power for the motor advice and assistance. Holtz Racing for the company and donuts.